Halloween has come and gone, but I couldn’t let it slip away entirely without posting Kit’s costume. We were originally taking the easy way out with costume parts that we already owned. She and her dad were going to be fairies together. 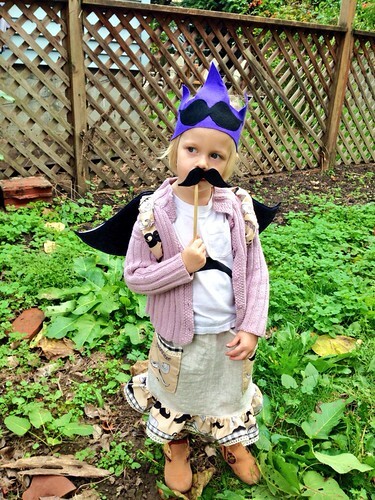 However, the day before Halloween, she announced that she wanted to be a mustache. A big mustache. 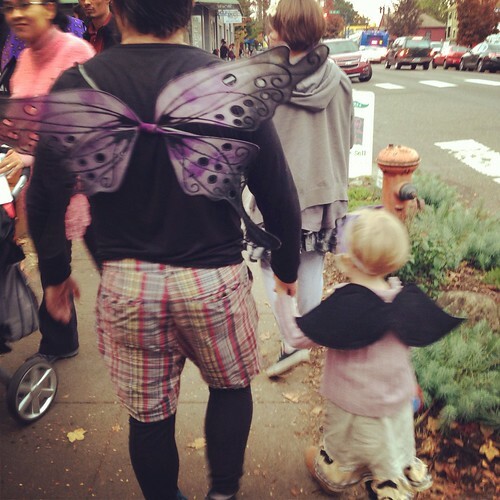 I, however, was quite wedded to the idea of bearded Jeff in fairy wings and a tutu, so I was unwilling to let go of that idea. Therefore there was compromise. The Mustache Fairy and her sidekick Beardo the Hairy Fairy. 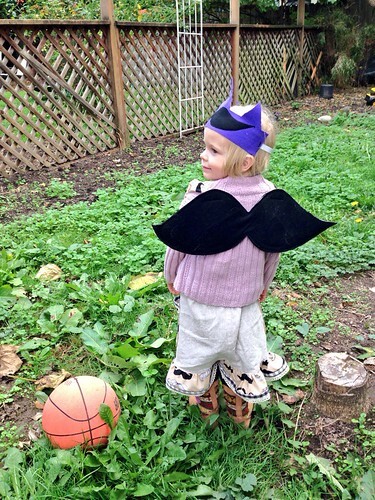 The mustache fairy wings are made from black wool felt, with mustache fabric covering the elastic. We made the skirt with a border and pockets from the mustache fabric trimmed it out with gingham and crocheted lace that Gunnar brought back for me from his exchange trip to Germany (sent by his lovely host mother). There’s a handlebar mustache stenciled onto the t-shirt and of course a mustache wand and crown (both from scraps of the black felt. We pulled it all together in a day from supplies we already had, which is both awesome and a little embarrassing. Blurry, but she was moving fast. Beardo had sadly gone without his tutu at this point – something about “straining the seams” in the child size tutu. Maybe next year he’ll need his own. I’m deeply disappointed that Jeff didn’t wear a tutu.